Ensure your pet's ultimate outdoor safety with these 7 best rated outside dog pens that will keep even the largest breeds securely confined. Would you like to provide your four-legged companion with an access to sunshine and fresh air without having to constantly supervise him? Don’t like the idea of using an invisible fence for your dog? All you need is a quality outdoor dog enclosure for your furry friend. These pens are capable of hosting one or more canines for a longer period of time. They are often seen at pet shelters, where the workers use them to provide dogs with temporary accommodation. They are also used by dog breeders and farmers, who use these enclosures to contain their dogs overnight. Dog cages for outside usage can be of extreme importance to people who like to keep their dogs outdoors or simply can’t allow them to spend time inside the house. A quality model is guaranteed to keep the pup safe from any harm, while still allowing him to bark in case of unwanted visitors on the property. For indoor use consider buying one of the soft-sided kennels. However, there are dozens of different brands and models on the market, each having a different size, design, locking mechanism, flooring, and other features. But have no worries – we’re here to help you out! After you finish reading this post, we are 100% certain you will find a suitable outdoor cage for your dog. For more options see our top-rated crates from every category. The first thing to notice about this model is its high-quality stainless steel build. We can safely say that this is a very robust and durable model – it should easily withstand even the harshest weather conditions. Each inch of its frame is covered with powder coating, so there’s no need to worry about deterioration and corrosion. The frame combines steel bars and wire mesh to provide a secure environment for your pooch, with no sharp edges. The tight spacing between the wires will prevent the pup from biting around it, while the waterproof cover (which is included in the package) protects the dog from the elements. We should also mention that the cover offers UV protection that successfully prevents fading, peeling, ripping, and cracking. One thing we particularly like about this model is its tool-less assembly. It comes with pre-assembled wire panel design, allowing every dog owner to set it up for less than 10 minutes. The fact that it is available in three sizes makes it suitable for all breeds of dogs, as well as for both residential and commercial use. Another feature worth mentioning is the model’s 1.5” raised legs. These make removing the waste a lot more convenient – the ease of cleaning is always a huge plus in our book. When it comes to downsides, we didn’t like the fact that Lucky Dog Uptown Welded Wire not portable. Due to its substantial proportions, this model is not a suitable choice for those who often move their kennels around the yard. Boasting a wealth of outstanding features, this product offers excellent value for the price. It is, in our opinion, a fantastic choice for the owners of large breeds who don’t move their kennels too often. Next up is yet another highly popular model – the Advantek Pet Gazebo Modular. Sporting a similar price as Lucky Dog’s Uptown model; it features sturdy construction, lots of space, tool-less assembly, and a modular design. Let’s have a closer look at its features! Once you assemble the mesh design panels (they come as individual pieces), you’ll get a spacious outdoor space that can comfortably accommodate pets up to 180lbs of weight. Each board has been manufactured from 100% commercial-grade steel, which means that you won’t have to worry about durability. Of course, there’s also the access door with a fixed latch. The octagonal shape of this model is great when it comes to stability, making it suitable for the dog owners who live in windy areas. The package also includes a heat-resistant and waterproof cover, which is there to protect the dog from the elements. We were quite pleased with the quality of this cover – it looks and feels quite durable. Setting up the whole thing is exceptionally easy, and requires no use of special tools. One only has to use the included connectors to put the panels together in an octagonal shape and then just attach the roof-support arms to these connectors to make a frame for the roof cover. The last part of the assembly includes putting the cover over the frame and securing it – it’s as easy as that. One thing we particularly like about this model is that the manufacturer offers a wide array of accessories for it. Some of these include the nesting box, the tote bags, and the additional covers. These can quickly turn the Advantek Pet Gazebo Modular into an even better home for your canine friend. When it comes to cons, our only complaint is the ample space beneath the panels when the kennel is used on a solid surface – you’ll have to block it with bricks or other items. All in all, this model is definitely worthy of being considered for purchase. It takes minimal effort to assemble it, has strong panel structure, and provides ample space for your dog. What more could one want? Here we have yet another product made by Lucky Dog, which is undoubtedly one of the top-rated manufacturers of these items. Just like the other Lucky model we’ve reviewed, this one also features a modular design, but also a sturdier construction which is the main reason for its higher price. Coming in beautiful black color, this outdoor crate can be purchased in five different sizes, with the largest one also being the most expensive. No matter which format you choose, you will be getting a very spacious kennel that has been designed with the dog’s comfort and safety in mind. With this model, your canine friend will enjoy the freedom of being outdoors while not being on a leash. Each panel of this model sports seamless welding and doesn’t have a single sharp point, so you won’t have to worry about your pooch hurting himself. The durable and robust construction easily withstands all weather elements and corrosion, making it a perfect choice for your backyard. Of course, it can also be used indoors, with its modular design allowing the user to fully utilize his available space. The package includes one door that sports two locking mechanisms. The door provides easy access and is very easy to open and close, while the model’s anti-rust powder coating ensures that there won’t be any problems with the hinges in the future. Another thing that deserves praise is the tool-less assembly. To put all parts together, you will need no special tools – the construction is super-intuitive and very easy to figure out. Our only major complaint about this model is that it comes without a roof. Even though it can be purchased separately, we still think that it should have been a part of the package at this price. Even though it comes without a roof, this kennel still sports a construction of fantastic quality that gives it an excellent value for the money. One can arrange its panels in any way he wants and provide his pet with a safe and secure area for playing. As we said, the PawHut Covered Dog Box is a very sturdy model – its primary build material is the 100% commercial-grade galvanized steel. As you can already guess, this guarantees durability and reliability. The weight of almost 150 pounds, on the other hand, will stop even the largest breeds from turning it upside down. Although it makes transport pretty challenging, the heaviness of this model also has a good side (besides stopping the dog from rolling the kennel over). When used outdoors, the model doesn’t need to be anchored into the ground – it is stable no matter how windy the area you’re living in is. However, that doesn’t mean that you won’t be able to use PawHut Outdoor Box indoors. The bottom of each pole is flat, which means that one doesn’t have to worry about damage to his floors. With each panel being separate, one can also make the most of his space and assemble this product in any way he wants. One of the best things about the whole deal is the canopy top, which is included in the package. It’s a reversible, weather and UV resistant cover that will provide your four-legged friend with the necessary protection from sun and rain. When it comes to downsides, we were displeased to find that this model requires assembly, which isn’t as easy as it is with the other outdoor kennels we’ve reviewed. It requires the use of tools, and it took more time than we initially expected. We can safely say that PawHut has made a pretty good deal here – the Outdoor Covered Dog Box is an excellent option for the owners of large breeds, mainly due to its heavy, durable construction. MidWest Homes for Pets is a well-known brand to all dog owners – the company manufactures pet equipment of highest quality. This time, we’ve decided to take a look at one of their outdoor cages, as we heard a lot of good things about it from our readers. Is it worth the money? Let’s check it out! No matter which of the three available sizes you choose, you will be getting a pretty spacious kennel. The biggest version (10’L x 6’W x 6’H) is absolutely enormous and effortlessly provides your canine friend with ample space for playing. As you can already guess, this makes the model highly suitable for the owners of large breeds. One thing we especially like here is unique patented design. The corners are rounded; removing the need to worry about injuries, with the latch being secure and operable with just one hand. This enables the owner to handle the door with one hand while still holding the pet with his other hand. The whole thing can be assembled and ready for use in about half an hour, checking the “easy assembly” box. Furthermore, the huge size of this model doesn’t make it difficult to move around – it is lightweight enough for just one person to easily move it around the backyard. All three versions come with a sunscreen top. The fact that this is a woven cover means that it doesn’t entirely block the sunlight, but only around 80% of it. This is our biggest complaint about the model, as we think that MidWest should have provided a better canopy top for this kennel. Even though it’s not perfect, the MidWest Homes model still offers a very good outside containment solution for your pooch. Owners of large breeds will get the most out of this kennel, although they’ll have to purchase a better canopy – the one included with the model just doesn’t cut it. Founded in 1991, the PetSafe is now one of the most well-known manufacturers of pet equipment. One of their products is the PetSafe Cottageview Boxed, which is a dog kennel for large dogs, sporting aesthetic looks, and an easy assembly. Is it worth the money? Unlike some of the competing models, this product offers a straightforward setup. It takes less than an hour to assemble it, requiring just one pair of hands to connect its four panels and the gate. For the DIY averse or impatient pet owners, this feature will be invaluable. Providing roomy 5’x5′ proportions, the model offers a spacious area for your pooch to play or relax in. It’s a perfect choice for medium and small breeds, although it can also accommodate larger dogs. The model’s welded design successfully keeps the dog safe and secure, while its durable, rust-resistant frame easily withstands all elements, be it rain, snow, or excessive summer heat. Sporting an innovative gate panel, this model turns the pet protection into a very simple thing. It’s a pinch-proof door that can be configured on either side of the kennel, letting the owner pick the most convenient setup for his four-legged companion. The door goes outwards and inwards, allowing you to make the most out of your available free area. The package also includes a free sunshade, allowing the pet to enjoy his time in the box during the hot summer months. However, we have to say that the shade isn’t really the most durable we’ve seen so far – active breeds could easily damage it. The PetSafe Cottageview Boxed has a look that’s far more impressive than that of the competition. Its beautiful black powder finish makes it look very modern and attractive – if you’re searching for an eye-pleasing enclosure; this is the way to go! Wherever you decide to place it, this model will provide your dog with a play/relax area that’s safe, secure, and pleasing to the eye. Combining style with functionality, it’s one of the more luxurious choices – definitely consider purchasing it if you have the money. As the name suggests, it consists of eight separate panels that the user can assemble in any way he likes. He can provide the dog with a vast play area in the backyard or use just a couple of panels to block off an area indoors. This kind of modularity makes the model highly versatile and deserves special praise. The panels themselves are made out of steel, with one of them serving as a hinged door. The dimension of each panel is 31″ x 24″, which should be more than enough to prevent small and medium breeds from escaping. Of course, one can easily buy more panels, connect them, and cover a much larger area. Assembling this model and taking it apart is extremely easy, thanks to the simple assembly instructions. The fact that the package includes eight ground stakes will allow you to secure the kennel in place when used outdoors. This will prevent an active dog or the wind from toppling the fence. However, one of the most significant advantages of this playpen has nothing to do with its materials or functionality – it’s the price. It is one of the most affordable products of this type on the market, which, in turn, makes it suitable for those with lower budgets. For a moderate sum of money, you’ll be able to provide your pooch with a secure area for playing and relaxing. On the downside, it is not tall enough to prevent the larger dogs from escaping. It is, like we said, best suited for small and medium breeds. Cheap and effective, My1stPet 8 Panels Metal is the kennel to go for if you’re on a tight budget. This is especially true if you own a smaller dog – it will keep him safely contained whether you set it up indoors or outdoors. Most models are manufactured from either chain link, steel wire, or expanded metal. Various materials provide different levels of durability. A choice of material will also determine the look of the product, which means that a personal taste also has some influence. Buying a tarp-style cover for the kennel is a very wise decision. It is something that will protect both the dog and the pen’s frame from the scorching summer heat and elements such as snow and rain. In case you’re not planning to purchase a tarp-style cover, you’ll need to ensure that the model is sturdy and that it can easily withstand the elements. After all, you will be keeping the enclosures outdoors, where things like snow, rain, and heat are unavoidable. Another thing to consider is how many doors there will be on your dog’s future kennel. Some models come with double-safety doors, preventing the pooch from rushing out once the owner enters the kennel. On the other hand, some of them have waist-high doors, enabling owners to put food and water into the enclosure without having to fear that the pup will jump over and escape. Some models are open, and some feature enclosed top parts. Those who own small canines and are concerned about dangerous predators should definitely consider purchasing a model whose top portion is covered. Even though it can be quite easy to attach the dishes to walls by yourself, maybe you should consider purchasing a model that comes with pre-attached bowls. These dishes are often connected to panels that can be moved around and to the outside of the enclosure, allowing you to add water and food without having to get inside the kennel. Some models feature the so-called “digging bars” – they are situated around the kennel’s edge and sit against the ground, with the purpose of preventing the pooch to make his escape by digging. These are an absolute necessity for the owners of digger dogs. With these factors in mind, choosing an appropriate outdoor kennel for dogs should be a lot easier. Also, a word of advice – don’t put your dog’s favorite toy (a ball thrower or a chewing toy, for example) close to the cage in the first few days of use. He’ll want to get to it and potentially hurt himself in the process. What Are Dog Kennels Used For? Spending some time outside is an integral part of every dog’s life. Unfortunately, this also brings a couple of risks – it’s quite easy for your four-legged friend to get lost or sick, mainly if he’s a senior or a puppy. The outside kennels present an excellent solution for these kinds of situations. They are capable of providing the pet with a place where they will be able to relax and play, and they also prevent the playful puppies from getting into accidents. It gives the pooch an opportunity to enjoy the great outdoors without getting lost. An owner can use it to train his dog. It takes care of the pup in your absence, removing the need for constant supervision. It serves as the dog’s escape from the monotonous indoor life. It protects the puppies or sick dogs from outdoor predators. Unlike the kennels, which sport a metallic construction (similar to that of the playpens) and are capable of accommodating more than just one canine, the dog houses have a more decorative look. Built to look like minified human houses, these provide the dog with their own cozy space. Once your puppy starts spending time in the laundry basket or under the desk, he is trying to find himself a den. The puppy is seeking for an area that’s snug enough to hold his body heat but still allows him to turn around for 360°. In an ideal kind of situation, this “den” will have walls on only three sides, with one side being open to potential “threats.” This is why we use dog houses with these same features, although with a touch of aesthetics so that they can be an attractive addition to our backyards. However, the dog houses should be used only for calm, well-trained canines that won’t leave the backyard without the owner’s permission and who don’t get into accidents too often. For the more aggressive pups and for those that need some additional protection, a big dog kennel for outside is the best solution. What are the Ideal Flooring and Platforms for Outside Kennels? 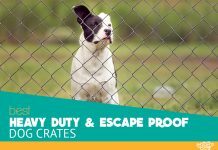 Unlike the heavy-duty dog crates, the outside kennels for dogs don’t offer as much comfort. For that matter, an owner should use foam-like cushions in case his canine friend is about to spend the night in it. On the other hand, if your four-legged companion spends most of his day in the kennel, installing PVC flooring is a much better idea. These kinds of floorings are very easy to keep clean – one only needs to combine a kennel disinfectant with a pressure washer. Another option would be to place it out on the grass in your backyard. When purchasing any kind of a playpen, make sure to consider the individual needs of the pooch that will be staying in it. If you, for example, own an older canine who is suffering from arthritis, make sure to provide his old and sick body with appropriate support. Younger puppies urinate and defecate quite frequently, so take that into consideration too. Due to the fact that hygiene and cleaning are of essential importance, take all of these things into consideration before shopping. So, which model is the best for your furry mate? Only you know the needs of your dog and what kennel will work the best for him, as well as for your own situation. When choosing this type of a pen for your pet, the most crucial things to consider are the dog’s size and what the product will be used for. Those looking for a large dog kennel for outside that easily withstands wear and tear and provides the pooch with ample space for playing should consider Lucky Dog’s Modular Welded Wire model. It will successfully contain the dog, keep him comfortable, and it will last a long time. Just keep in mind that you’ll have to purchase or make a waterproof cover for it. If you, on the other hand, need a model that can be used both outdoors and indoors, another product from Lucky Dog should be of great use to you – the Uptown Welded Wire model. It is affordable, well-constructed, and flexible enough to be used both inside and outside the house. However, this doesn’t mean that you shouldn’t check out the other models we’ve reviewed – one of them just might be the thing you were looking for all this time.